At the Region is an ongoing feature that discusses the state-by-state training, certification and employment requirements of first responder departments across the nation. 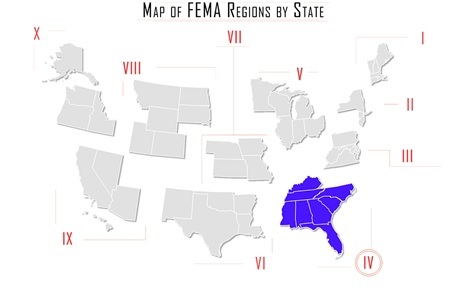 In this issue, At the Region looks at the Law Enforcement Certification requirements in Part One of FEMA Region IV: Alabama, Florida, Georgia, and Mississippi. The Alabama Peace Officers Standards and Training Commission governs the entry and training requirements for all Alabama Law Enforcement Officers. Changes were made to the entry qualifications in 2014 as well as other required training for all officers in the state. As of January 1, 2014, “The Basic Training Curriculum has increased from 480 to 520 hours and the Lateral Entry Equivalency / Law Enforcement Officer Refresher Course has increased from 80 to 95 hours.” Applications are made online and must be completed within 10 days of Law Enforcement Employment. 2. Gainfully employed in full time law enforcement (including Corrections Officers) at the time of the Peace Officer Academy Application. The Alabama Peace Officers Standards and Training Commission Administrative Code can be found here. Certification requirements, including the number of academy hours, testing requirements and physical agility exam can be found here. For information about the Physical Agility and Ability Exam, check the guidelines here. 12 Approved Continuing Education Units are required annually for all Officers in Alabama. Chiefs and other executive Law Enforcement Officials require 20 annual hours of approved CEUs. Alabama will consider reciprocity for Certified Law Enforcement Officers trained in another jurisdiction with a minimum of one year experience, or officers with no more than a two year break in service. Alabama offers qualified applicants from federal and military service a lateral reciprocity if all requirements are met. To view the reciprocity (waiver) and lateral certification requirements, view the PDF here. For general APOSTC questions regarding policy, certifications and related matters, please use the email address apostc@apostc.alabama.gov. You may also call their main number 334-242-4045. The Florida Department of Law Enforcement governs the certification and training of Florida Law Enforcement Officers. In Florida, individuals may become certified as Law Enforcement Officers, Corrections Officers, and Correctional Probation Officers. 1. Meet the minimum qualifications. 2. Complete the required training. 3. Pass the State Officer Certification Exam (SOCE). 4. Become employed as a sworn officer. • Have earned a high school diploma or equivalent (GED) for law enforcement and corrections applicants. A bachelor’s degree is required for correctional probation officers. • Not have been convicted of any felony or of a misdemeanor involving perjury or false statement. Any person who, after July 1, 1981, pleads guilty or nolo contendere to, or is found guilty of a felony, or of a misdemeanor involving perjury or a false statement, shall not be eligible for employment or appointment as an officer, not-withstanding suspension of sentence or withholding of adjudication. • Never have received a dishonorable discharge from any of the Armed Forces of the United States. • Have documentation of processed fingerprints on file with the employing agency. • Pass a physical examination by a licensed physician, physician assistant, or certified advanced registered nurse practitioner. • Have good moral character as determined by a background investigation under procedures established by the Criminal Justice Standards and Training Commission. Step 2: Complete the Required Training pursuant to 11B-35, F.A.C. An individual must pass a Commission-approved BAT prior to entering a basic recruit training program. The BAT is available at most training schools and results are valid for four years. An individual must successfully complete the Florida Basic Recruit Training Program or Cross Over Training Program for the respective discipline. Training must be completed at a Commission-Certified Training School. Step 3: Pass the State Officer Certification Examination (SOCE) pursuant 11B-30, F.A.C. Upon successful completion of the required training, an individual has three attempts to achieve a passing score on the SOCE. • See this link for more information on the State Officer Certification Exam (SOCE) and the application process. Individuals who have completed the required Basic Recruit Training and passed the State Officer Certification Examination have four years from the start date of their Basic Recruit Training Program to become employed as an officer in Florida. Certification Process - Obtaining a "Certificate of Compliance"
• Have processed fingerprints on file with the employing agency. 2. The individuals' employing agency will apply for the Certificate of Compliance. 3. After confirming all requirements, the officer’s certificate is issued by the FDLE Records section. For more information concerning the certification process, contact the Records Section at (850) 410-8600. 11. Be interviewed by the manager of the GPSTC Regional Academy where the student will attend training. For more information about Georgia Peace Officer and other Public Safety Training, visit their website here. Reciprocity for all or part of previous law enforcement training may be granted for qualified applicants with at least three years of law enforcement experience. The Equivalence of Training (EOT) process requires proof of graduation from an out of state, military or federal law enforcement training program, have no more than a three year break in law enforcement service, and your current certification is still valid. After proof of the requirements, an exam is given. Check here for more information regarding the EOT program. The Board on Law Enforcement Standards and Training (BLEOST) governs the requirements for Mississippi Law Enforcement Officer Certification. Mississippi has statewide training programs for Law Enforcement officers, six full-time academies and many part-time academies. These are associated with the Colleges and Universities within the state. Training is completed at one of the accredited academies prior to certification. • And be of good moral character as evidenced among other things by having neither a conviction, a plea of guilty, a plea of nolo contendere, probation, pre-trial diversion or the payment of any fine for a felony or a misdemeanor involving moral turpitude. Individuals must have been discharged from the Armed Forces under honorable conditions. Fitness for service as it relates to moral character must be verified by an appropriate background investigation. Reciprocity: Mississippi offers reciprocity for Certified Law Enforcement Officers certified in other jurisdictions to qualified applicants through Equivalency of Training (EOT). Officers must have successfully completed an acceptable basic law enforcement training course to be eligible for certification based on equivalency of training. • An acceptable basic law enforcement training course shall be defined as: a. one that meets an approved state standard for mandated training which leads to certification as a law enforcement officer. Applicants may qualify for an alternative basic course equivalency based on experience, education and training. The alternative basic course equivalency is awarded on a point system which considers Law Enforcement Experience, Education and Previous Training.